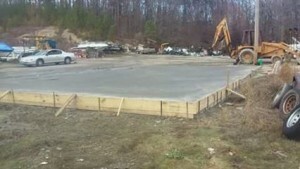 Building a solid concrete foundation or slab. Recently we was contracted in hot springs, Arkansas to build a foundation for 1 building and 2 slabs for a carport and concrete parking, it took about 100 yards of concrete and 5 days to complete. 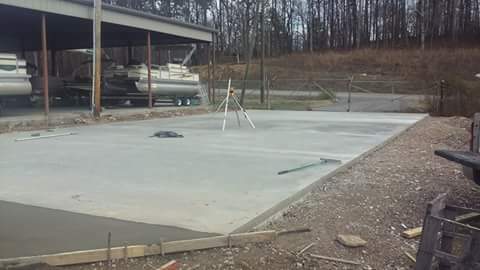 The first slab we will talk about is a 30 x 50, It was setup and poured monolithic with the footings being 2 feet wide and 1 foot thick. We used a 4000 psi concrete mix with fiber mesh, but no fly ash or air. This floor required a slick machine finish. 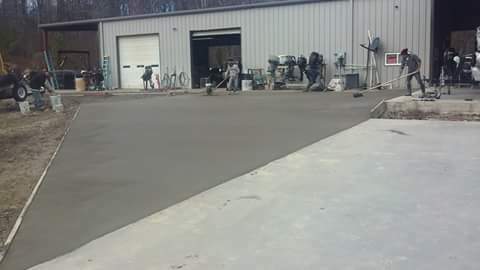 The 2nd concrete slab we poured was a 34 x 74 slab that will hold basically a carport building on it, it was poured with a 4000 psi mix with fiber mesh, no fly ash, but air added this time because its a broom finish. 3rd and final concrete floor on this job was approximately 1,900 sqr ft and we stuck with old faithful there and 4000 psi concrete with fiber mesh and no fly ash. The overall job turned out great, the customer was very happy and he is a great guy to do work for!